Today I’m happy to have Karon Thackston back on the show. If you don’t remember Karon, I had her on episode 74 where we talked about how to optimize an Amazon listing for maximum sales. She’s been helping ecommerce clients get both higher rankings in search and higher conversion rates with the power of copy for the last 25 years. She’s the author of 10 books and she runs the popular site MarketingWords.com which I recommend that you check out. Anyway, last time we focused on tactics for optimizing Amazon listings. Today, we’re going to talk about copywriting strategies to increase sales. Karon’s recommended way of getting reviews. Recent changes to Amazon search. Does enhanced brand content make a difference? How Amazon search differs from Google search. You’re listening to the My Wife Quit Her Job Podcast, the place where I bring on successful bootstrapped business owners, and delve deeply into what strategies are working and what strategies are not in business. 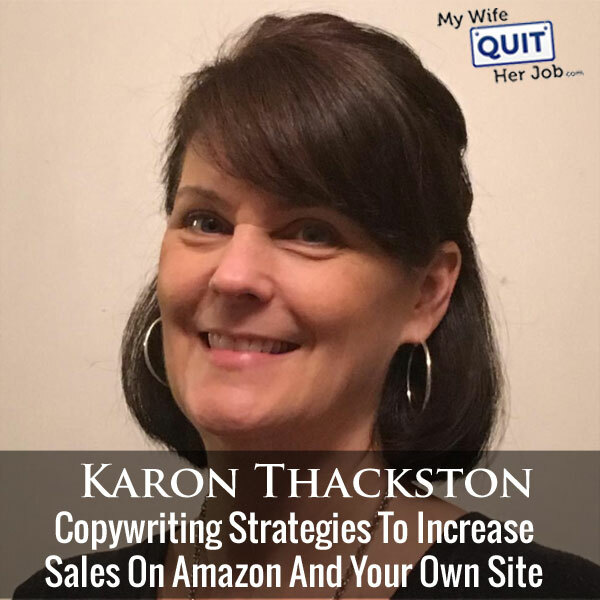 Now today I brought Karon Thackston back on the show, and today we’re going to talk about copywriting strategies to increase sales for physical products online. But before we begin, I want to give a quick shout out to Klaviyo who is a sponsor of the show. Now I’m super excited to talk about Klaviyo because they are the email marketing platform that I use for my ecommerce store, and I depend on them for over 20% of my revenues. Now, Klaviyo is the only email platform out there that is specifically built for ecommerce, and here is why it is so powerful. Klaviyo is the most powerful email platform that I’ve ever used and you can try them for free at mywifequitherjob.com/K-L-A-V-I-Y-O. Once again that’s mywifequitherjob.com/K-L-A-V-I-Y-O. Now I also want to give a shout out to Privy who is also a sponsor of the show. Privy is the tool that I use to build my email list for both my blog and my online store. Now what does Privy do? Privy is an email list growth platform, and they manage all of my email capture forms. And in fact I use Privy hand in hand with my email marketing provider. There is a bunch of companies out there that will manage your email capture forms, but I use Privy because once they specialize in e-commerce. Right now I’m using Privy to display a cool wheel of fortune pop up. Basically a user gives their email for a chance to win valuable prizes in our store. Customers love the gamification aspect of this. And when I implemented this form email sign ups increased by 131%. Steve: Welcome to the My Wife Quit Her Job podcast. Today I have Karon Thackston back on the show. Now if you don’t remember Karon, I actually had her back on Episode 74 where we talked about how to optimize an Amazon listing for maximum sales. And she’s been helping e-commerce clients get higher rankings in search and higher conversion rates with the power of copy for the last 25 years. And she’s the author of ten books; she runs the popular site MarketingWords.com, which I recommend that you check out. But anyways, last time we focused on tactics for optimizing Amazon listings. Today we’re going to talk about more copywriting strategies to increase sales, and just get a pulse on the overall landscape on Amazon today. And with that, welcome to the show Karon, how are you doing today? Karon: Hey great, how are you? Steve: Yeah I’m doing great, and I’m really glad to have you back. It’s funny that one of my students actually posted about you on the Facebook group, and that’s when I realized, hey I haven’t had Karon back on the show for a very long time. I definitely had to have you back. Karon: Well I appreciate it, and I like hanging out in your group. You guys have some great ideas and conversations going on in there. So, always interesting when I spend some time over in your space of the Facebook landscape. Steve: So I know you actually deal with a lot of Amazon clients. And so what I want to talk to you about first is since you have a previous post on the matter, how is the Amazon landscape changed, what are some of the issues that have been popping up within your community? Karon: I am still finding a lot of people that come in from other communities, or folks that are in our Facebook group that are newbies that aren’t quite getting a handle on what changes have taken place as far as keywords go and the whole new Amazon 250 thing. Steve: Why don’t you give an introduction just in case people listening don’t know what you’re talking about? Karon: Yeah, let’s start from the beginning. Amazon way back five, six, seven years ago probably started out with a 250 character maximum in the search term fields. Some categories now show that as generic keyword fields. And they changed that a couple of years ago to 5,000 characters, which a lot of people still think that the 5,000 character limit is in place, which is Amazon’s fault. I think they should put hard stops there. However, earlier this year Amazon made an official announcement after a lot of speculation that they were in fact going back to the 250 character limit. Amazon listed as 250 bytes, and bytes differ. A byte equals one character if it’s a letter or number. A byte can equal two characters if it’s some special question mark or special character on the keyboard, which you typically would never have in your search terms anyway. Karon: Spaces don’t count, they used to. Amazon is saying spaces don’t count in the 250 now. So you get a couple of we still stick to 250 or below instead of trying to guess how many spaces we had in there. That gives us six more characters. It’s not worth all the trouble to do that in my opinion. So now we’re back to 250. You do not have to fill out all of the search term fields or the generic keyword fields whichever one your particular category says. You can put them all in one field if you want to. However if you go past 250 characters, Amazon will ignore everything that you’ve put into the search term fields. And people are still of the impression that because the field will actually hold the 5,000 characters, the total of five fields will hold 5,000 characters that they’re still allowed to do that. So they’ve either left 5,000 characters worth of keywords and phrases in the backend, which are probably now not being indexed or used for ranking at all because 5,000 is way more than 250, or they’re not understanding what needs to go in the back end keywords and what doesn’t. If you have the keyword in your title, in your bullets or Amazon says in your description, then you don’t need to repeat it in your backend search term fields. Steve: That’s interesting, so that implies that the bullet points are now indexed? Karon: It does, and we have seen that for a very, very long time. In many style guides, not all of them, some of them are still anciently old and have never been updated. But in the updated style guides, probably about half of them tell you, you would be better off to put keywords in your title, your bullets, and your description than to put them in the search terms. Amazon makes a point of stating that the search terms are optional. They’ve said that for a very long time. They make a point of saying that when you put anything in the backend search terms or generic keywords, whichever one you assess, that it is, to paraphrase, you’re making a suggestion. And Amazon is not in any way, shape, or form obligated to use the information you put in the search terms. They would much prefer that it be in the copy somewhere. And this goes — my suspicion, underline the word suspicion is that eventually just like Google, Amazon will say bye-bye to the search term fields, or either they just won’t give them any credit at all whether they make it public or not like Google did with the meta keyword tag years ago. I haven’t heard that from anybody at Amazon, but Amazon is following down the Google path from years ago with a lot of their changes. So it makes sense that they would eventually say if the keyword or phrase is that important, it needs to be in your copy not in the backend. Steve: Here is something funny that did happen to me. So I had more than 250 characters on one of my listings at one point. And then one day for that particular listing all the sales tanked, and I wondered what happened. I looked and all of my keywords had disappeared. Steve: Yeah, it was the weirdest thing. And then there was another listing ahead where I exceeded 250 also, and then the sales just kind of tanked one day. And then I removed almost all the keywords and just used like maybe three or five on each line, and then the sales just came back. Karon: I see, here is something that has people confused too, because you’re hearing all these different stories like yours. Now I had never heard anything about somebody’s keywords just disappearing before, that’s a new one for me. But because there’s so many variations of what’s going on, and because Amazon historically never rolls anything out to everybody across the board at the same time, you get people that say, well I took all my keywords out and it ruined my listing. Or I went down to 250 and all my traffic going away, or the reverse, all of my traffic went away until I went to below 250 characters and then it came back. So people get really frustrated not knowing what to do. And because every listing is unique, there are points where you’re just going to have to test and tweak and like you, you paid attention. You had things happening, you went in there, and saw, okay well I still have too many key phrases or keywords, let’s just dial it back so I might see what happens and fix the problem. So patience is key, testing is key. Steve: So what is your best practice, what is your recommendation in general now with these keywords? Karon: Yeah right now we are going with high le [ph] relevant search terms in the backend. We aren’t doing anything that’s extremely broad. If it’s not a synonym, a substitute for what you’re calling the product, you know if you have a stainless steel water bottle or something to that effect, some people would put water jug in the backend or something around that. If you would not substitute a water jug for this water bottle, then don’t use that is one of my rules of thumb. It needs to be people have the mindset of, well if you’re looking for a water jug then you need something that’s going to deliver water. So maybe they would be interested in a water bottle too. To me that’s too broad. Steve: So do you have your clients now fill out all of the 250 characters? Karon: If they are not highly relevant and have a really good search volume, we don’t. I am not somebody that will tell you use every character available to you regardless of what you put in there, because we have seen too many times where using irrelevant keywords has actually turned around and bitten people in the rear end. You get folks with the water jug example. They’re looking for water jug, yours pops up, and the picture maybe the water bottle kind of looks like a jug or something. So they click on it, they go over and go, this thing only holds 20 ounces, that’s not a jug, that’s a bottle, they click away. That bounce if it’s repeated over time, Amazon pays attention. And they’re going to start demoting you in the search rankings because they only want to list the products that are selling. So when you lose your rankings you’re also going to lose your sales, or either your PPC costs are going to go way up, and you’re going to have to drive them with an additional fee through their monetary system. But there’s too many times where going broad has turned around and ruined everything. So we stick with the relevant words. Steve: Okay and presumably though that the rankings would only go down for that specific keyword, but you’re saying that putting less relevant keywords will ruin your rankings in general. Is that correct? Karon: Not necessarily for everything, no. I don’t have any proof that it would ruin the listing for everything. For the terms that you’ve put in there that are broad, that’s going to drag it down. However, Amazon would be looking at the listing overall is my guess. So if you’re dropping for a handful of keywords that are too broad, it’s still going to drag your data down. Steve: Okay and so just your overall product conversion metrics is what you’re saying essentially? Steve: Okay and then you’ve had clients where you’ve removed some of these faulty keywords and their sales have increased? Karon: We have. We have also had clients where we have put all of the relevant keywords in the copy and had nothing in the backend, and they did wonderful. Now let me stop here and say pay attention to what I’m getting ready to tell you. I am not advocating that you do that. We ran three tests, one two, three, that’s it. So it’s in its very early stages. But to me that is a mild indicator that Amazon is actually for once in its life doing what it says, and it really does prefer to have the keywords in the copy. So our rule of thumb at Marketing Words is put as many keywords and phrases in the title, bullet, and description as you can without it sounding stupid. Steve: Okay, that’s good advice actually. Karon: You don’t want to confuse or irritate customers. They’re the ones sitting there holding the credit card. Getting great rankings is awesome, but if you can’t get anybody to buy what’s the point? Steve: So I’ve actually heard rumors also that like the first line of the keywords has more weighting than the others. Do you have any evidence of that? Karon: I don’t, we typically at this point in time are just telling people to put everything you’ve got in the first field. But I haven’t heard anything about it being more powerful than the others. Steve: What about the first ten characters let’s say of the title? Karon: Not the first ten, I mean I haven’t heard anything about the first ten. What I have been told by a couple of different leadership team members at Amazon were that the first 80 were indexed and used for ranking. The others might be indexed, but at least according to these people, not necessarily used in Amazon’s ranking algorithm. Steve: Okay, I mean I know that sometimes the total gets truncated depending on what device you are on. So it pays to put your messaging I guess towards the front of the title so it never gets truncated depending on the device and the screen size. Karon: Right, and sometimes you’re not going to get a whole message through there. I mean the [inaudible 00:16:00], a little tiny. You get something like 35, 37 characters, that’s not a lot of space. Steve: Yeah, so however we talked about manipulating all these keywords and titles and that sort of thing. And you know Amazon doesn’t really allow you to easily split test these things. So I was hoping we would talk about your process for doing the testing to make sure in fact that one of your changes is actually making a difference. Karon: Yeah absolutely. There are some common mistakes that most people make when they’ve never done any testing, and they’re doing it manually. Obviously there are service tools out there that you can use to conduct split tests and what have you, but you still have to know what to test. So what we do through group, a monthly group that we have called a listing lab. It’s not a copywriting service; it won’t teach you how to write listings. It’s specifically for testing listings you already have, is create two lists a month, two tests a month that you would do either through a tool that you have a subscription to or manually either one, and also teach people how to do the testing. So the first thing would be actually using a tool that allows you to do what’s called multivariate testing. If you’re doing things manually, you would want to make one change to your title, or one change to one bullet, or one change to your search term section or something to that effect, which is slow. But if you go in and you take out a keyword that was in your title and put a different one in, and you tweak a bullet and you found three other search terms you think would be great in your backend, and you get wonderful results, you have no idea which of those three brought about the change. So you don’t know whether to keep tweaking your title or change some more bullets or put more keywords, or take those keywords out. So, do one test at a time, and only change one element at a time so that you are fully aware of what did or did not make a difference. Steve: What tool did you recommend? You mentioned some tools, what have you use in the past? Karon: Well the only thing — we don’t actually do testing as a service at Marketing Words. So what a lot of the people in Listing Lab, and a lot of our other clients use is one called Splitly. Karon: I have not used that tool, so I can’t tell you anything about it. But I have not heard anybody that’s come back and said anything negative about it so far. There may be people, but the reports so far are good with Splitly. So if you don’t want to do all of these things manually, you can use a tool like that or something else that’s available, and set them up to run automatically. Steve: So you recommended testing exactly one thing, letting it run for two weeks and then changing it back, right? Karon: If it’s possible we like to do the same amount of sessions looking at traffic instead of [overlapping 00:19:21]. But with smaller listings sometimes you don’t have that luxury. If you’re only getting a few hits a day, you may just have to do the time frame and wait two weeks and take a look at it. Steve: How many sessions are required to come to a conclusion or not a conclusion but to get a good idea? Karon: In a perfect world you’d want to do a thousand or more. Steve: A thousand or more sessions, okay. And how do you determine whether it’s actually statistically significant or not? Karon: This is where you get to go looking your data, and I’m a data geek so that thrills me. But a lot of people go; oh you got to be kidding me. It’s really simple an Amazon. If you go into reports and then business report, say you looked down the left hand side, you want to look at details by child item. Even if you don’t have variations in the listing, the details by child items seems to be more specific and more accurate. You can look at the number of sessions which tells you how many shoppers have been to your page. You can look at of course the number of sales. And in there is something called unit session percentage that is Amazon’s version of a conversion rate. So taking a look at all of these will give you a general idea about whether you’ve had success with your listing or not. If you’ve put in new search terms, look at your sessions. Has that driven more traffic, did you have the same amount of sessions when you look at the dates or the amount of traffic previously as you had in this test, or did it go up down what have you? If you got more traffic, did that traffic result in more sales? If you got more traffic but nobody bought, then maybe you need to take those search terms out and try some other ones that would drive traffic that would convert to sales. So digging around in there, I could get lost digging around in the data all day long. Steve: Yeah, I just have a couple of questions. I mean this isn’t really a true split test because it’s two weeks for example and then you’re changing it up in two weeks. So there just seems like there’s so many variables in play, right? There could be seasonality, there could be like a social media mention that happened that drove a lot of sales like how do you kind of factor all those things in? Karon: That’s why you want to look at a large number of sessions when possible, because that’s usually going to happen over a longer period of time. You can also go back and look for trends. If you’ve been doing testing for a while and you’re used to looking in the data, you can go back and look at what happened over a 30 day period previously, or over a three month period previously. But you do have to be aware of your own products. So if you have a product that’s seasonal for summer only, and you’re doing testing in January, you’re probably going to get inaccurate results. So you’ve got to incorporate some common sense into this as well. But you are correct, usually with ABs, you’ve got two tests running simultaneously, so it sort of accounts for some of these anomalies. And you can’t necessarily do that in Amazon. They will not allow you to create two identical listings and then tweak each one to run them side by side. Steve: Right, so I guess — so this is like a very long term thing this split testing, right? Karon: It’s not a quick fix and it’s for people who understand the value of testing and want to get in the habit of doing that every month and seeing how they’re able to improve those listings. Steve: I was going to say like it implies that you should only do larger changes to your listing so that the changes are more obvious. So what are some of the things that you recommend people split test immediately? Karon: Definitely the search terms. Especially with a limited number of characters that are being used by Amazon now, you want to be sure that the ones that you put back there (a) are actually helping and (b) are driving visitors to your pages that are converting. A lot of the information can be found in PPC campaigns. If sellers are running those sponsored ads, you can dig in there and find more detailed information down to the keyword level that will also help you make those determinations. But that would be one of the first things that I would do especially with all the changes going on. I would also recommend testing the variations of keywords that you put in the title. So if you’re selling dog treats, crunchy dog treats, chewy dog treats, jerky dog treats, dog treats for allergy dogs, you’ve got all these different variations, they all still have dog treat in them. So I would suggest testing the variations of dog treat, or whatever key phrase applies to your product of course, and seeing which one of those polls better. A lot of times people immediately go for the ones with the highest search volume, but often ones with lower search volume that are referred to as long tail key phrases that are more specific have a higher conversion rate. Steve: Okay and so that’s just a matter of testing. I’m surprised actually that you didn’t talk about the image, like for some reason the first thing I think about in terms of conversion is the main header image. Karon: Well Marketing Words does words. So it’s not marketing images, it’s marketing words. So we don’t have anything at all to do with images or any other part of the listing, only the ones that deal with words. Steve: Okay, let’s talk about enhanced brand content for a little bit. Have you noticed with your clients where using this has dramatically increased conversions? Karon: We have not. It has made some improvements, but not to the point where I’m ready to tell every seller you need to develop a branding, get into the brand registry and what have you. I have seen a lot of talk in various Facebook groups where people have said after going through everything to get the EBC listing up and the additional cost and yada, yada, yada, it was okay. Steve: Interesting okay, because it’s a lot of work to actually put up the EBC on all of your listings? Karon: It is, and it gets expensive. If you’re not doing the listings yourself I mean obviously it takes a lot more work for whoever is developing the listing. So if you’re not doing yourself, you’re paying that to somebody to do it, there’s an additional cost there, there’s an additional cost with Amazon. But it has not — we haven’t seen the comments from people, our clients or in other Facebook groups that have backed up what Amazon said with 25% improvements in sales and all the statistics that they originally quoted. Some people are getting, but I would say at least half of the comments we’ve seen have been, uh it’s okay. Steve: Okay, so in terms of priority, where should you be focusing your optimization efforts? Karon: In the title and the bullets. The description is sometimes being indexed, sometimes the whole thing is not being indexed, sometimes you get the first however many characters that are being indexed. And honestly at this point I have not found any rhyme or reason to it. I can’t identify any common denominators at this particular point in time. The bullets however do seem to be indexed reliably. So I would focus on including the search terms in the title and in the bullet points at this point. Steve: So a couple of minutes ago you mentioned testing the backend keywords, and then you maybe earlier in the interview you mentioned that one of your clients had nothing in their keyword fields. I was just curious what the rationale was for not having any keywords in the backend? Karon: We wanted to see what would happen. Steve: Okay, so it’s just a test, you don’t actually recommend this, right? Karon: No. What I was saying do not. We did it with three listings only. I do not recommend that you run out and remove the search terms from the backend. Steve: Okay. Let’s switch gears a little bit and let’s talk about reviews, review copy, right? Ever since Amazon has allowed people to opt out of getting e-mails, it’s been harder to get them. So it makes it even more important to kind of improve the copy on your solicitation emails so you actually get a good percentage of reviews. So what is your recommendations there? Karon: There are a couple of things that happen that I think contribute greatly to e-mails not being opened, or customers not responding to review request emails. And one of them is that virtually every seller out there is using the exact same template that every other seller is using. The other thing is that the subject lines, people are defaulting to putting the product name and the order number in the subject line, which for a lot of people is an indicator that the message is a spam message. They’re trying to trick you into, oh your charge of $427 for your order has been fulfilled, those kind of spammy messages, and they put the order number in there and what have you. So one thing that I recommend is doing unique review request e-mails, which is a lot more work than using the exact same template for every single product that you have. However, we have actually had folks that have used the suggestions in the review advantage eBook that we have that emailed us back and said, you know what, I just got two thank you comments for the review request emails that we’re sending out. And that just never happened before that I’ve seen. So people are looking for helpful useful information. It all boils down to the, what’s in it for me mindset of clients. When they get emails that all look the same and all pretty much say the same thing, and they are give me, give me give me, you know we want you to leave a review, and could you please do this, and could you click over here and give feedback, and all the information that’s in there. And then they get different emails that say, hey you just purchased this brand new skillet from us, and here’s a couple of recipes you can try, or here are some tips for keeping that brand new nonstick skillet in perfect use, some things that you may not be aware of, or here are some ways that you can do other things with the skillet besides frying. Maybe you remind them that the handle is not rubberized. It’s a metal handle, so it can go straight in the oven too. And when you start giving information that customers find useful and helpful and are grateful for, then you increase the chances that you’re going to get reviews. You certainly do ask for a review in the email as well. Not only that but you create a lot of goodwill too. Steve: For those resources that you mentioned, are you implying that you are linking people and taking them off to a different site or just within the email? Karon: Within the email, absolutely not linking to another website. Steve: Okay, and then no attachment – actually I don’t even know if you can do attachments, and nothing along those lines, right? These are simple content messages? Karon: Right, within the email themselves. And yes certain attachments are allowed by Amazon, but what we recommend is including it in the body content of the email. And what about the subject line. You said don’t use the product and the order number, what are some examples of emails that have been working really well for your clients? Karon: A number of tips. Email works well for example three unique ways to use your new nonstick skillet, or five tips for getting the most from your new nonstick skillet, or something to that effect. You could also do, if there are things — I wouldn’t use this if there isn’t something urgent that needs to be said, but if there are use tips that people need to be aware of the immediately, you could say stop, or warning, or wait, don’t use your new skillet until you read this. Karon: It needs to be true however. So if its — we’ve used to that for example with baby products that there was something that needed to be done with the product before the first use or what have you. So it was justified then, but don’t use that type of subject line just to get attention and then not deliver with an urgent message. Steve: So it’s almost like running a blog and an e-mail newsletter at that point. You’re sending out content? Karon: Mostly content with the request for the review. Steve: Okay, and can you just talk about like the phrasing, say you provide a good piece of content and then you say something like, well if you enjoyed this content, would you mind helping us spread the word. What are some of the exact words that people have been using when you get to the review part of the e-mail? Karon: You cannot legally say if you have done anything, then come and do this, that’s now against Amazon’s terms of service. They want these to be completely unbiased. So the review actually comes in as pretty straightforward. You say thanks for buying, here’s the information that we want to share with you, and then when you get to the request for review, you simply state, we would love to have your opinion about your new skillet, please take however many minutes and leave a product review on Amazon. Say we understand you’re busy, if you’re willing and have a few minutes, would you please leave a review. But nothing about if you’ve loved your skillet, we’d love to have your opinion, if you appreciated the tips we’ve given, all of that. Amazon is now considered as a way to incentivize the review essentially. It’s some sort of manipulation because you’re not saying regardless of what you think, if you liked it or not come and leave a review. Steve: Okay and your examples have implied that you should be sending out product specific e-mails. But let’s say you have too many skews to do that, what is a good I guess generic way to write the e-mail? Karon: That would be a difficult thing to do for the approach that we take. If you have lots of different skews that are the same but different, lots of different types of shampoo for hair growth for example, but maybe one has added jojoba oil or something else, slight differences in there, you could probably write in groups and use tips that were applicable to all the different types of shampoo. But in order to use the approach that we talk about in the review advantage eBook, I don’t think you’d be able to do a generic one. Steve: Okay, so it seems like the general like at a very high level at least, the advice is to provide some sort of value through your content, and then ask for the review? Steve: Okay and then phrase the e-mail not like a receipt type of e-mail, but like a piece of content that someone would actually want to read? Steve: Okay and can you just kind of comment on some of the results that you’ve had with some of the students in your class when switching over to this method? Steve: Oh it’s an eBook okay. Karon: It’s an eBook, but like I mentioned before, when people have applied this we’ve gotten comments back either in the Facebook group or that have emailed to us saying that they’re actually getting thank you notices from the customers. Sometimes the customers are leaving it in Amazon feedback or in the review itself saying the information that this seller provided, one of them was child probiotic drops. And the information that the seller provided in the email he sent was extremely useful to me in knowing how to best use the probiotic drops with my eight month old or nice touch or something to that effect. And that’s not an entirely uncommon thing to have happen if you provide quality content. Steve: Okay and it’s kind of want to conclude this interview by asking you what are some of the common mistakes that you’re still seeing people make on their Amazon listings? Karon: Five hundred character bullets. Steve: Five hundred character bullets okay. Karon: They drive me crazy for a couple of different reasons. On mobile for one thing, I don’t think people pay enough attention to Amazon mobile. They work on a desktop or a laptop computer and they’re looking at their listings on Amazon. But when you 500 characters per bullet with five bullets that all show on the page depending on the layout that your listing ends up having on Amazon is a big chunk of words, and it’s really reader unfriendly. It’s even more so if you look at it on a mobile phone, and you literally have to keep scrolling three or four times to get all the information, and all the person is seeing is a big chunk of words. We much prefer, and we have gotten much better results with bullets that are at least half that length or shorter, because you get more that show up especially in the format with the pictures at the top and the three bullets are showing at the bottom and you have to click them all, and on mobile devices where you only get the three that are going to show before you click the arrow. So shorter bullets is a biggie. Steve: Interesting, that’s like counter-intuitive because since the bullets are indexed it seems like you’d want to put more information there. I actually personally have not noticed on my phone because there’s always a show more when I shop on Amazon on my phone which collapses everything. I actually only see like the first bullet point in fact, or the first two maybe. Karon: But when the bullets are shorter, more show. Karon: Okay, any other mistakes that you’ve seen? I’m sure you see a lot of plain mistakes, any other ones that come to your attention? Karon: Yes, with the keyword research, I still think that people are going too broad; they’re not being relevant enough with Amazon. Steve: Give me an example of that actually, a quick example. Karon: Something that a lot of people do is they’ll go broad and use accessories. So we will go back to the water bottle example. And maybe it’s a water bottle that you can use when hiking because it has little carabiner hook to put on your backpack or what have you. They’ll put things in the search terms like camping accessories, way too broad. Yes you might be able to use water bottle while you are camping, but most people are not going to consider that a camping accessory. Steve: Okay, got you. So it seems like the general trend that you’re advising is to just focus on less, less is more essentially? Steve: Okay, well Karon I did want to give you an opportunity to talk about — like the last time we talked I think you only had maybe five or six eBooks or products available. Now I looked and I think you have over ten I want to say. So can you talk about what you have to offer, and what you’ve added lately since the last time we spoke? Karon: Sure absolutely. The Amazon product description boot camp is something that we added a little while back, and it is a live event that is recorded. We just closed that out a couple of months ago, so it is fully updated. The replays of that webinar, which were four sessions, we went for four weeks, and all of those are now available up on our site. And I will send you Steve a coupon so that people can save 20% off of the Amazon product description boot camp. This is very detailed. We where you through keyword research, you watch several sessions of keyword research, doing the titles, doing the bullet points, doing description, but we also get into Amazon mobile, and we also get into the basics of testing as well in all these video sessions. Something else that we added is called Listing Lab, which we talked about briefly just a minute ago. That is a testing group, it is not of course. It’s for people who want to start testing their listings and need help figuring out what to test and how to test. That gives you two tests that I have created each month that you can either manually implement on however many listings you want, or you can use it along with a tool like Splitly or some other Amazon split testing tool if you use those types of things. So that is something that can help you gradually over time see improvements with your listings as well. And then there’s the review advantage eBook, which is the one we just talked about that has all of the suggestions and the formatting and the how tos of how to create those review request e-mails that do include helpful content for your shoppers as well as a request for their review. And I’ll send you coupon codes for all of these. Steve: I’ll link all this stuff up in the show notes. I do you want to just give a quick endorsement; the eBook that you offer on just Amazon listing optimization is excellent. I highly recommend everyone go pick it up. It’s really inexpensive, and it’s a no brainer. Karon: Thank you, that’s Amazon Advantage, the Amazon Advantage eBook. I appreciate that very much. Steve: Well Karon I appreciate your time, and thanks a lot for coming on the show. Karon: Thank you, see you next time. Hope you enjoyed that episode. Copywriting plays a huge role in sales, and it’s nice to get it straight from someone who has helped hundreds of ecommerce store owners improve their sales. For more from information about this episode, go to mywifequitherjob.com/episode194. And once again I want to thank Privy.com for sponsoring this episode. Privy is the email capture provider that I personally use to turn visitors into email subscribers. They offer email capture, exit intent, and site targeting tools that make it super simple as well. And I like Privy because it’s so powerful and you can basically trigger custom pop ups for any primer that is closely tied to your ecommerce store. If you want to give it a try, it is free. So head on over to Privy.com/Steve, once again that’s P-R-I-V-Y.com/Steve.